Predicting the future course of the dry bulk market has proven to be more than difficult these days, with most estimates falling way off the mark given the unpredictability of freight rates and the effect of one-off events, like the recent Vale accident, which took out of the market a major part of dry bulk cargoes. 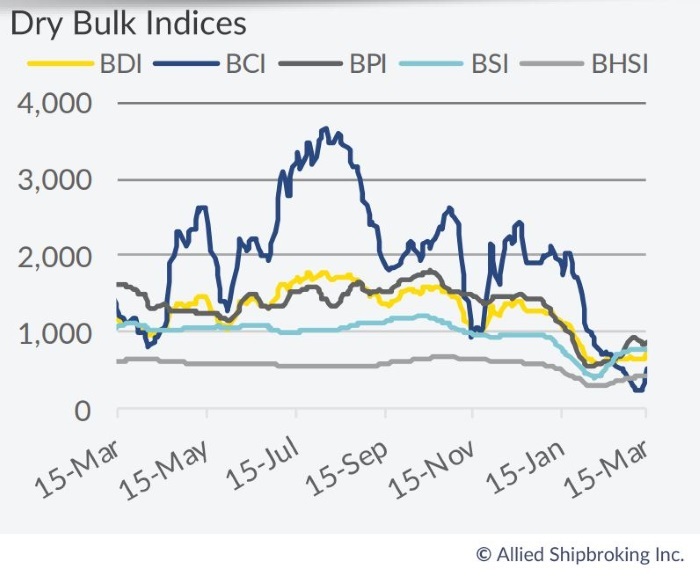 In its latest weekly report, shipbroker Allied Shipbroking said that “it is rather superfluous to mention the overall bearish mode that has taken grip of the dry bulk sector right now. With the BDI index having witnessed an average of 642 basis points since the start of the previous month till today, and the Capesize 5TCAVG, at the same time, easing back to US$ 6,290/day, the argument behind this bearish feel seems more than self-explanatory. In the pursuit of looking for a silver lining in all of this, many would point to the current “ill” state being but a mere reflection of a single, unique shock (referring to the Vale accident), or to use a more technical term, part of a “tail risk””. According to Mr. Thomas Chasapis, Research Analyst, “up until very recently the market was monopolized by views influenced by modest earnings, limited Orderbook, stability, and periodical bullish freight rate runs. While at the same time it is worth noting that there are still some “hints” of the above attributes still at play. Let’s ignore for now the larger size segment (and its unique situation and problems it faces) and narrow our focus on the medium size units (namely Panamaxes and Supramaxes). Yet again, we haven’t experienced a market environment that has been inline with what most would have predicted, or, dare we say even, expected back in the summer of 2018”. Mr. Chasapis added that “however, given that we are still at a very early stage in the year, there is plenty of room to offset some of the negative trends noted so far. To better capture the current state of things, we need to employ a more quantitative approach and present some comparisons. 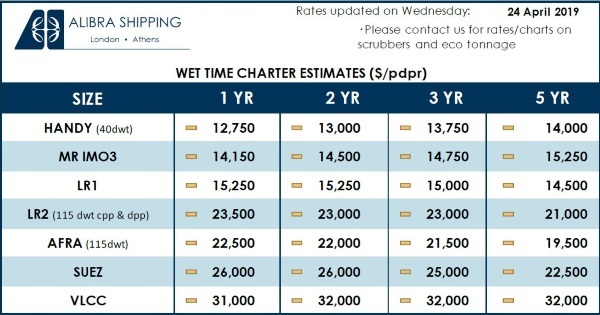 The Panamax’s BPI-TCA average figure for the year so far is currently running at US$ 6,877/day, while that of Supramax is at US$ 7,783/day. Calculating the averages for the same time frame last year we see that the respective figures were at US$ 11,310/day and US$ 10,415/day. So, taking into consideration that we are still facing similar seasonality in our trade, these two size segments have seen a 39.2% and 25.3% decline in their earnings respectively”. Allied’s analyst also noted that “moreover, if we were to take a quick look at forward prices as noted in the FFA market, we would see this point further supported. During the summer period of 2018 when the market was at a relatively strong point, the closing figures for both the Supramax 10TC-AVG and Panamax 4TC-AVG for 1Q19 contracts were trading in the region of high US$ 11,000/day more or less. Notwithstanding this, let’s stick take a more positive turn on things. 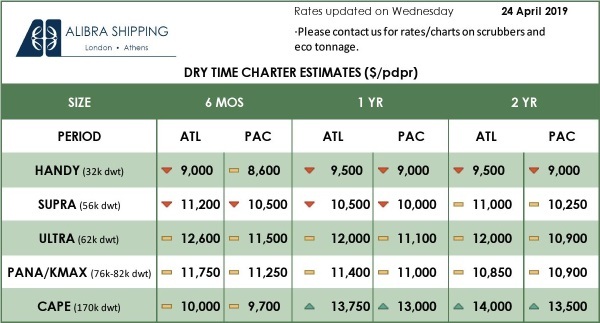 Despite the steep downward spiral that we have noted since the onset of the year, the Panamax and Supramax freight markets have managed to recover relatively quickly. From their lowest figures at the very start of February, both segments managed to see their TCA figures boosted by an impressive 60.3% and 80.1% respectively, helping boost sentiment and leaving for a hint of optimism for the remainder of the year. Given the current view on core fundamentals, this optimism may well have some solid basis”. “With all this being said, we will leave you with one last point in the market that may or may not have some significance. For all the main dry bulk size segments, except Supramax, FFA contracts referring to calendar years 22 and beyond have moved sideways the past couple of weeks. However, for the Supramax 10TC, we have witnessed a significant negative shift, something that may well be due to a large position taken, otherwise it would leave for a highly ambiguous shift in forward sentiment for one of the most diversified segments (in terms of cargoes covered)”, Chasapis concluded.